26th day of the year. There were then 339 days left in 2019.
on the 4th week of 2019 (using US standard week number calculation). 37th day of Winter. There were 53 days left till Spring. The U.S. government is finally open again. RT if you think Congress should pass legislation to prevent future shutdowns. 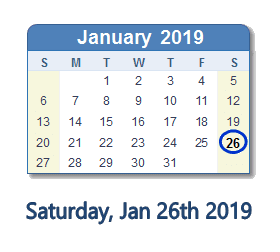 What happened on January 26th 2019?